The One Eau de Toilette by Dolce & Gabbana - A new floral fragrance for women. A fresher version of the original Dolce & Gabbana The One perfume. Inspired by the spirit of Naples, the new scent created by perfumer Michel Girand, includes notes of white Madonna lily, bergamot, and mandarin. The original The One Eau de Parfum perfume bottle gets an updated gilded cap and elongated bottle. Launched in September 2017 this new fragrance is available in an eau de toilette spray from Macy's and ULTA. 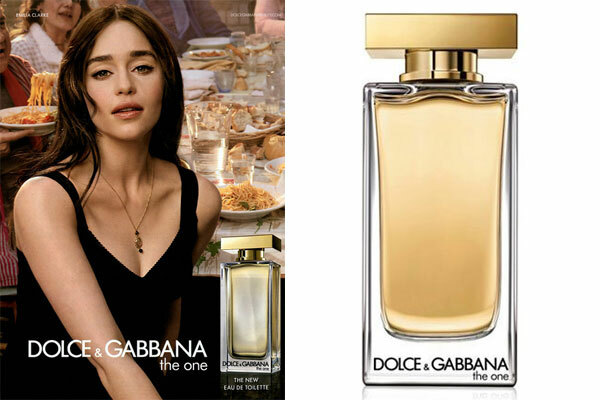 The perfume campaign features Game of Thrones actors Emilia Clarke and Kit Harington walking the streets of Naples directed by Matteo Garrone. Package Design Original The One perfume bottle elongated with a gilded cap.